Map of California numbering plan areas (blue) and border states. Area codes 657 and 714 are shown in red. Area code 714 is a California telephone area code that was split from area code 213 as a flash-cut in 1951. Area code 657 is an overlay of 714 that became effective on September 23, 2008. It encompasses northern Orange County, a portion of Los Angeles County, and the Sleepy Hollow and Carbon Canyon areas of Chino Hills in San Bernardino County. Area code 714 originates at Westminster Blvd East Runs down to High Rise Ave.
Cities in the 657 and 714 area codes include Tustin, Placentia, Anaheim, Buena Park, Costa Mesa (unique because it is split between the 714/657 and 949 area codes, at Wilson Street and along Newport Boulevard), Cypress, Fountain Valley, Fullerton, Orange, Garden Grove, Santa Ana, Villa Park, Yorba Linda, portions of La Habra, and most of Brea, and Huntington Beach. The 714 area code once included most of Southern California, generally south and east of Los Angeles, extending to the Arizona and Nevada state lines to the east, and south as far as the Mexican border (what is now area codes 442/760, 619, 858, 909 and 951). It experienced several splits, the first of which moved San Diego County, Imperial County and the desert areas of Riverside and San Bernardino counties into area code 619 on November 5, 1982. It was again split, moving eastern Los Angeles and the Inland Empire areas of San Bernardino and Riverside counties into area code 909 on November 14, 1992. On April 18, 1998, the southern cities of Orange County were split from 714, creating area code 949. 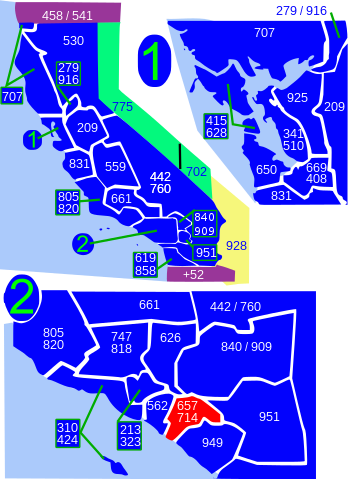 The two area codes now cover northern and western Orange County (except for portions of La Habra and all of Seal Beach, Los Alamitos, the far northwestern portion of Brea, and the western portions of La Palma, which have always been in the same area code as Long Beach—currently the 562 area code). This is probably because at the time those splits first occurred, while most cities in Southern California were provided primary local telephone service from what was then Pacific Bell (now AT&T), the cities listed above were served by GTE (now Verizon) which is the primary telephone provider for Long Beach. Today, five cities "straddle" the 657/714 and 949 area codes: Costa Mesa, Irvine, Santa Ana, Tustin, and Newport Beach.